Transits, Fiestas. Smax’s Mondeo’s… you name a ford and I’ve drained a ford, more than a few times. Putting the wrong fuel in your ford is not the end of the world, although it never seems to happen at a convenient time. Once you’ve drained the wrong fuel out of a hearse and an ambulance on the same day, you get an idea of how unfair the world can be, that said putting the wrong fuel in your ford is not the worst thing that could happen. Firstly, it is very unlikely you will have caused any real long term damage, your ford main dealer may be saying otherwise and wanting the best part of 5k for a new high pressure fuel pump, 4 new injectors, a new fuel tank, new fuel lines a new in tank pump, and just for good measure an oil change. baby and bathwater comes to mind. As much as the ford main dealer might be feeling the same economic pinch that affects us all in a recession, it is not necessarily your obligation to subsidise said main dealer who may be spuriously demanding money for work that in 99% of cases does not need done. Running your diesel fiesta/galaxy/smax on petrol by mistake until it breaks down is not the death of your car, once the wrong fuel has been removed then it is most likely the car will be fine, we do enough of them to know!. Even the AA recommend draining a misfulled ford before doing any other work, and only doing other work if the car is showing a fault, replacing x amount of parts on a whim with no fault showing may suit lottery winners but in the real world, only fix it if its broke. and if its got a wrong fuel problem – a fuel drain is the only fix you need 99% of the time. It is normal for a diesel ford engine to die after being misfuelled, don’t read to much into this, the engine is not dead, it just cant run on petrol, once the petrol is removed then it will start and run like it never happend. this includes fords that have been driven for hundreds of miles after a misfuel, or will not start the morning after a misfuel. Ford fuel tanks can nearly always be accessed under the bench seat in the rear, if you remove the sender unit which involves disconnecting the electrical plug and a flow and return fuel line you can directly access the fuel if you need to remove it. 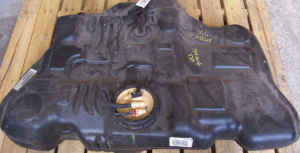 This is an 07 Mondeo fuel tank, note the flow and return lines and the electricplug on top of the sender unit, access this under the bench seat in rear. In a ford transit you the fuel is harder to get to but can be accessed from the top as well, the access varies from model to model, a word about emptying a transit tank, the van needs to be dead level to get all the fuel out. The advice here is for the motoring enthusiast, if you do ant to drain the fuel from your ford be safe and treat petrol with the respect it deserves.